I first met Nicole and Phil in July, 2008, at Jerry’s Deli in Marina Del Rey for a dinner date to learn more about their wedding plans, and to see if we had a personality and style match. After a few minutes, I could see that they were a great couple…Phil was cool, and Nicole was also a Psychology Major, so we were off to a good start! They were looking for a “relaxed, organized, and comfortable” celebration without any “cheesiness”…but they didn’t want a boring DJ! Since their wedding date was the day after Thanksgiving and all of their friends and family would be coming into town, they wanted to make sure that everyone would be glad they attended. We had a match, and in October, we met at Calamigos to plan their timeline, special songs, and discuss some personalized ideas. We kept in touch via phone and email, and when I received some of their finished “homework,” and as the song lists were finalized, I knew this was going to be an incredible celebration! Since I was providing the sound and music for their ceremony, I also attended their rehearsal. It was great to meet their parents, and Nicole’s Uncle Dave who would be officiating their wedding. I thought that Nicole and Phil looked excited and happy; they didn’t seem nervous, at all. 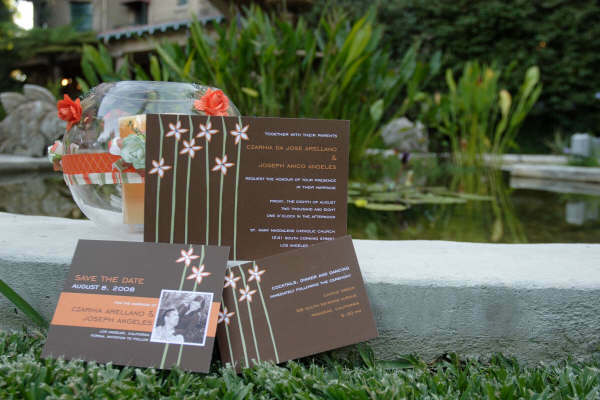 Custom pre-ceremony and ceremony selections set the tone for a meaningful and emotional ceremony. I think everyone held it together pretty well until Nicole began walking down the aisle with her father, Steve. Then Uncle Dave read another personal dedication and tribute, and I, too, had to reach for a tissue. Dancing requests included classic rock, group “sing a longs,” and the song of the night was “Bro Hymn” for Phil and his buddies, and that brought the house down! After that, we had to tone things down a bit…LOL. The evening ended with everyone surrounding Mr. And Mrs. Lish for one last dance, and then it was time to start their married lives together. I got to know Nicole and Phil very well, and I know they will put in the time and effort for their marriage, just like Nicole did for her softball career, and Phil does at his job. The best part of the evening was after I had already thanked them and said “goodbye,” and about 15 minutes later, they came up to me, we chatted some more, and gave each other a hug. I met this wonderful couple through their wedding coordinator, Tobey Dodge, and we scheduled a lunch meeting at their hotel. It was readily apparent that they knew their music, because when they were dating, they used to go out to clubs in San Francisco and stay out dancing until 3 or 4AM! I knew I would have to be on my toes, and we began talking about ways to incorporate their selections to create a loungey, fun, but not a “stuffy” affair. 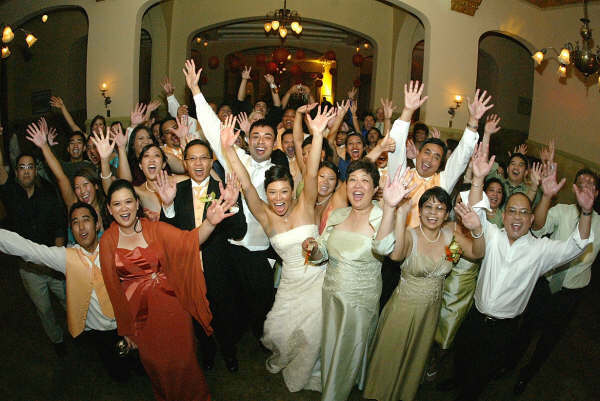 They wanted all of their guests to enjoy themselves, because most would be travelling from out of town or out of country, and they definitely didn’t want the YMCA, the Macarena, or a corny game show host! Since they are both busy and successful at their jobs, many emails flew back and forth across the country, and we also had a conference call or two to finalize their details and requests. We ended up with a really cool list of 50’s, 60’s and 70’s tunes, 80’s hip hop, 80’s pop, 80’s hair metal bands, 90’s hip hop, 90’s pop and rock, and some Top 40. The big day arrived, the ballroom was looking beautiful, and the weather was perfect for their outdoor ceremony! Hearing Stacy and David recite their vows to each other was a highlight that set the tone for their reception celebration. Suddenly, a Korean drum group signaled to their guests that dinner was next, and everyone followed them into the ballroom for a drum performance that had everyone cheering and applauding! Food was important to them, and the 5 course dinner didn’t disappoint! The socializing vibe included selections from Bocelli, some international and world music, Gypsy Kings, Jazz, and Sinatra. After the toasts and the entrée, Stacy and David held hands at their family table for their personalized, funny, and touching special introduction before their first dance as husband and wife. 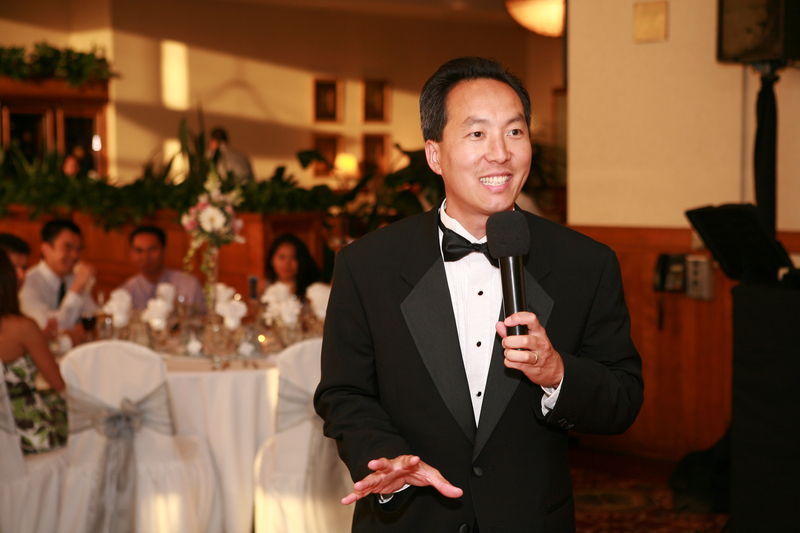 Their guests really enjoyed it, and it was my honor to share their story. Dancing and party time commenced, and I’m not sure who were better dancers….Stacy and her friends, or David and his buddies! We’ll call it a “tie,” as everyone was out on the floor having a blast. I’ll bet there were some sore feet the next morning! Later on, Stacy and David had their ceremonial cake cutting and gave their “Thank You” toast to all of their friends and family. Just before they got engaged, Stacy and David were living in New York, and they discovered that the city is a great place to be in love…now they are back in the city, living in the West Village, just a few blocks north of the spot where David proposed. Mr. And Mrs. Saenz, Congratulations! I know you’ll discover that New York will be a great place to celebrate many future anniversaries. Three words come to mind when thinking about this wonderful couple. Family, Fun, and…Fight On! Guess where Katie went to school? I met Katie, Greg, and Katie’s family through my friend Emily (thanks again, Emily! ), as Emily’s sister went to school with Katie’s brother. I remember sitting down in their family room and meeting everyone (including their dog, Liz), and that all of us couldn’t stop smiling and laughing! I could tell right away that both of them had great families, and that’s an important ingredient for a successful wedding celebration. They told me they were looking for a fun and traditional wedding with some personalized touches, but not a DJ who plays offensive music…or someone who would embarrass and upstage Katie (and Greg). Since I don’t make it a habit to be a game show host, we had a match! Katie and Greg both lived out of town, but staying in touch for our planning was fun, as Katie and I competed to see who was more organized (I think we tied). 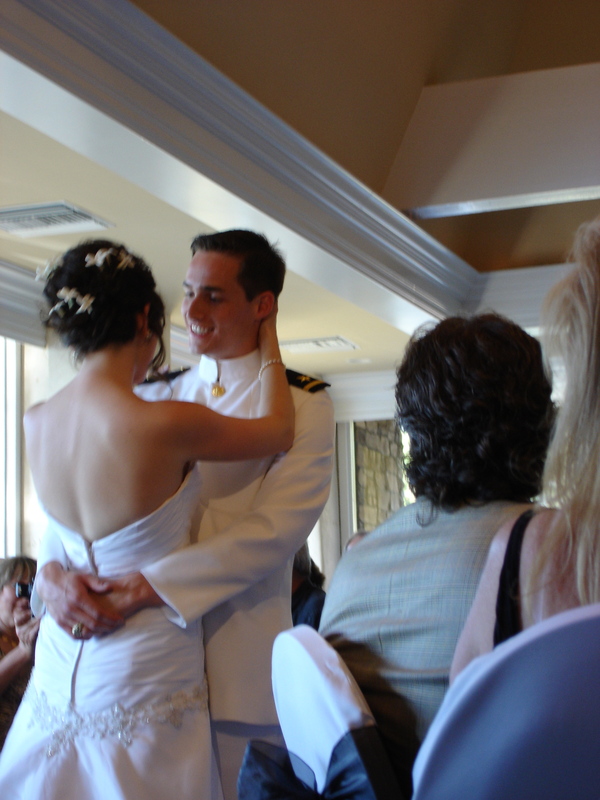 I also want to thank Katie and Greg again, because before they even had their wedding, Katie referred me to one of her USC roommates, Kate, who was getting married to Matt (not me) on January 5th, 2008 (please see my previous post). So I actually ended up performing at Matt and Kate’s wedding first, in front of Katie, Greg, and Katie’s parents….hey, no pressure! In May, we met again to finalize their wedding program, and it was another fun time. Katie’s parents are wonderful people with a great sense of humor, and before we knew it, June 8th had arrived. 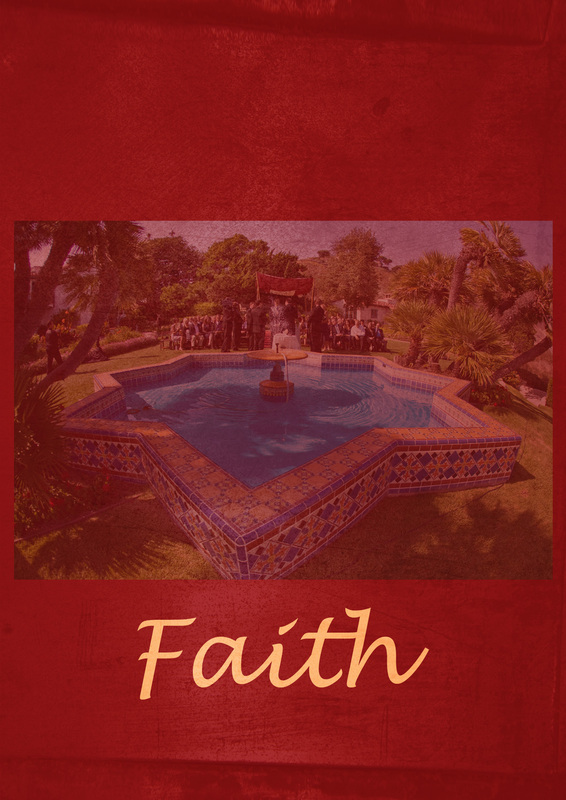 Their ceremony at the Tuscan Garden site was both beautiful and meaningful. But, what was this? At the end of their ceremony, their guests remained seated as the wedding party walked out first, then Greg’s groomsmen stood at attention at the back. Only then did Pastor Johnsen announce “Mr. And Mrs. Katie and Greg Pappianou!”, and as I played their recessional music, applause filled the air as they exited underneath an arch of swords! Very official looking and dignified. Everyone enjoyed cocktails as Michael Buble, Jack Johnson, Norah Jones, and Nat King Cole crooned in the background, and after recognizing their grandparents, parents, and wedding party with a personalized entrance, Ensign and Mrs. Greg Pappianou took the dance floor to “Young At Heart” by Frank Sinatra. One of the many dance highlights of the evening was “Shout!” Picture 60-70 people on the dance floor all jumping up and down at the same time…in a ballroom that’s on the second floor. I hope they didn’t cause any permanent damage to the building! Another unforgettable moment was when Katie surprised her Uncle Warren by inviting him to dance with her to “All I Want Is You”…no, not the U2 song…the one by Barry Louis Polisar. That made his night! 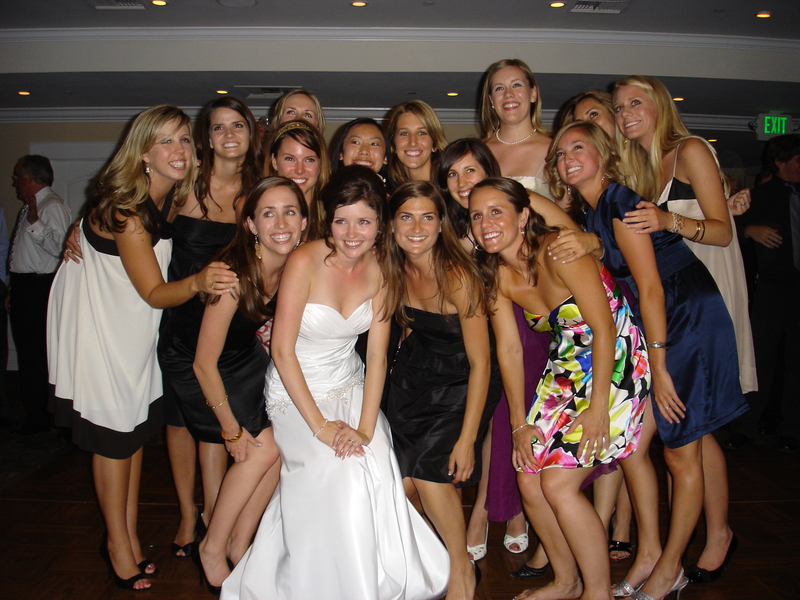 Later on, Katie invited her sorority sisters to the dance floor and they sang a few songs together! Then, (to the horror of any UCLA alumni that were in attendance), the “USC Fight Song” was cranked up, and the dance floor was full for the rest of the night. Since their entire group was young at heart, there was still a big group of people that were invited out to the lobby for the big sendoff! Katie and Greg, Larry and Wendy, thanks for everything, and I hope you had as much fun as I did. 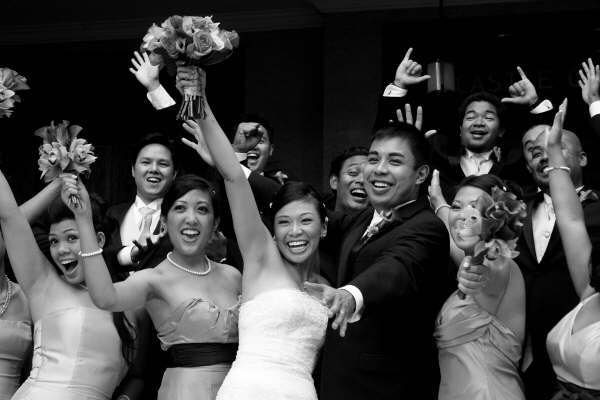 It all started with an inquiry from my wedding coordinator friend Maita Henson Miyake of Simply Marvelous Weddings asking if I was open for the “lucky” 2008 date. Normally it would be great to meet face to face, but since Joe and Czarhia live up north and have hectic work schedules, we traded a few emails and agreed to begin with a conference call. We hit it off, and had fun discussing how they met (childhood friends! ), their wedding plans, and some of Joe’s music requests. I also learned that they wanted a fun, upbeat, yet relaxed summer wedding that wasn’t boring, and to make sure their parents could relax and enjoy things, too. No problem! We kept in touch and our schedules finally matched for a meeting over Memorial Day weekend at Lucille’s BBQ in the Long Beach Town Center. If you’ve never been to Lucille’s (one of Rhia and Joe’s favorite places, and I believe it was where they went for their first date) you need to go! 8-8-08. How can you not love that date? All of their guests arrived in a festive mood for the reception celebration, and I could tell right away that it was going to be a party! 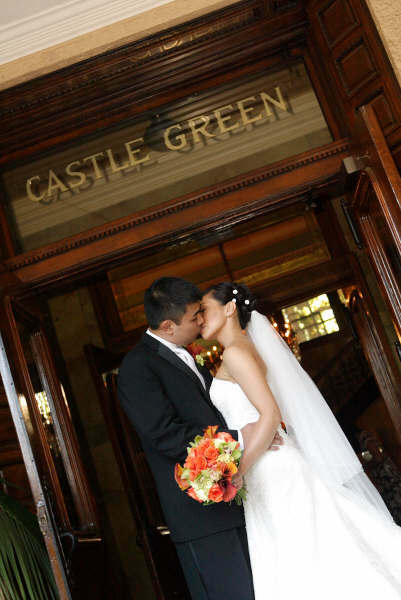 If you’ve never been to a Filipino wedding, the grand entrance is REALLY GRAND! We recognized their cord sponsors, veil sponsors, and principal sponsors, parents, bible bearer, coin bearer, ring bearer, flower girls, ushers, their wedding party (they had some great dance moves! 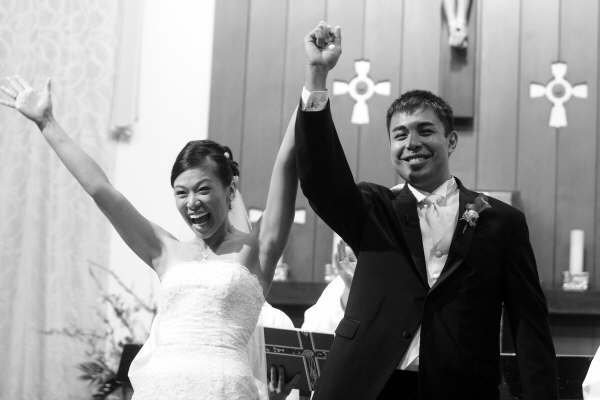 ), and finally, Mr. And Mrs. Czarhia and Joseph Angeles! It was all worth it, because the songs they chose helped to create an energy in the room that was just amazing! 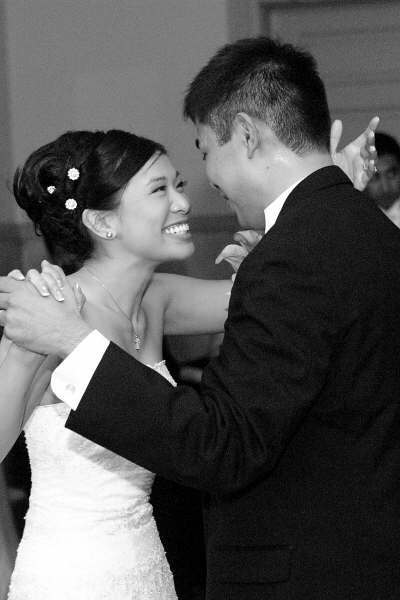 Their special introduction before their first dance was entertaining and touching, and then Joe escorted Rhia out to the center of the dance floor where they showed off their choreographed moves to “Bubbly” by Colbie Caillat. Very classy, and all of their guests voiced their approval with cheers and applause! During dinner, we included some of their music selections that they had played at their engagement party, and rat pack classics (but NO Kenny G., LOL!). An hour and a half passed, and all of a sudden it was 11PM! Michael Buble’s “Save The Last Dance For Me” ended the evening on a high note, as Czarhia and Joe continued their “Farewells” and “Thank you’s” before heading off on a road trip to San Diego, Disneyland, Las Vegas, and Monterey. If you haven’t guessed by now, “8” is Rhia and Joe’s lucky number, and you take good luck when it comes your way. But I’m pretty sure that Mr. And Mrs. Czarhia and Joe Angeles already knew that they were blessed. So by now you’ve seen some photo credits to James Hickey Photography on my website and blog. Well, now you get to see a few more! 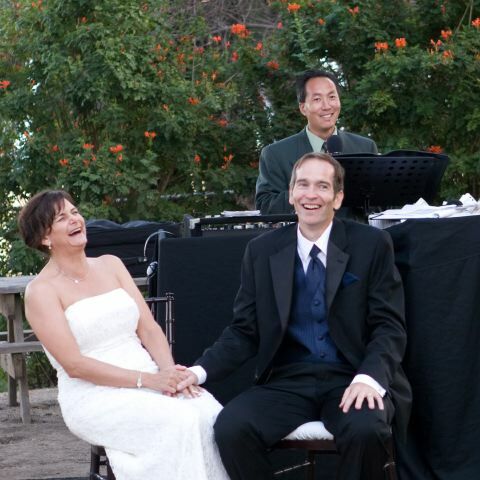 James and his wife Monika are great friends with Randy and Todd, so that made their Wedding Entertainment Director search a “little” easier. We connected, began emailing back and forth, and it was fun to learn about her dog, and also Todd! Both of them have a great sense of humor, and Todd gave me a run for my money with his extensive musical knowledge (he used to live in San Diego, so you know he’s cool!). 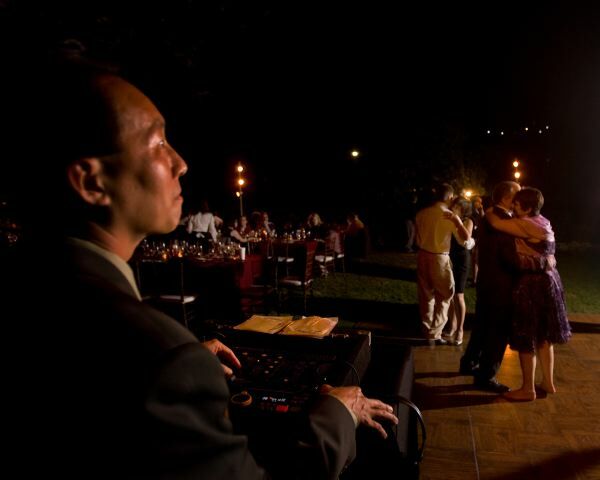 During our planning, I confirmed that I understood that they were looking for great music and a non-cheesy Master of Ceremonies, and they also had some personal touches that they wanted to include in their wedding program. After increasing the value of Apple’s iTunes stock, our playlists were set and ready (Randy and Todd, sorry that you had to do some “minor” cutting down from your original list! ), and it was time to get married! I was able to accommodate these 3 professionally trained singers with my ceremony system (in addition to mic’ing their officiant, Todd, and playing their music tracks), and they did not disappoint. Afterwards, guests were entertained by Todd’s special cocktail mix (of music), including selections by The Beatles, The Moody Blues, and Al Green, and then they went down below to the dinner area. Grand entrance song for the family members? “Gratitude” by Earth, Wind, and Fire. Their entrance song? “You’ve Made Me So Very Happy” by Blood, Sweat, and Tears. All of Todd and Randy’s attention to their special songs was paying off! …before their first dance to “Colour My World” by Chicago. They chose this song because of Randy’s creative, artistic background, and because Todd loves the group Chicago. See how smart they are? For the dancing, everyone filled the floor and had a great time without the Chicken Dance or the Macarena…not that I would play those songs out of the blue, and anyway, Randy would have killed me. Twice. Their group danced the night away, and I took all of the credit (sorry, Todd!) as each song seemed to be a huge hit, and people who were at the bar would scream and run out to the dance floor. To be fair, though, a lot of a DJ’s art and talent comes down to reading the crowd, and knowing which song to play at exactly the right time. As it came time to say “farewell,” Louis Armstrong’s “What A Wonderful World” ended Mr. And Mrs. Randy and Todd Wright’s celebration the way they wanted. Perfectly. Randy and Todd, Anne and I just got a new puppy, and I think we should get together sometime soon with James and Monika. I’ve got the perfect soundtrack. When I first sat down with Susie and Lee, it was like meeting old friends! We chatted about how they met, and anything and everything (including golf, “Dancing With The Stars,” the Lakers, and more golf!) for almost two hours. I learned that they place a high value on their friends and family, and after meeting some of them during our planning session, I knew this was going to be an extraordinary celebration. One of the many special things they wanted to include in their celebration was their friend Artie’s daughter, Anna Maria, who is a gifted singer, and I was looking forward to hearing her perform. On Friday afternoon (after pulling the guys off of the golf course, Wood Ranch Golf Club has wonderful food, service, and golf! 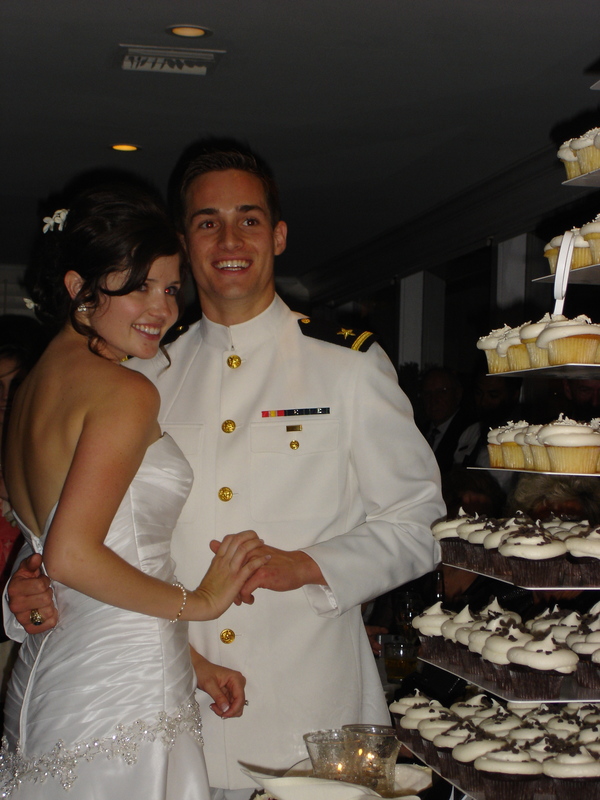 ), I attended their ceremony rehearsal and dinner, and again, got to meet more of their family and friends! All of them were very excited and happy for Susie and Lee, and they were quite a festive group. The big day arrived, and as the ceremony began under perfect sunny skies, everyone stood and stared as Susie made her entrance by horse and carriage. It was truly a magic and fairytale moment, and Anna Maria’s performance of “You Raise Me Up” gave all of us goosebumps. For their recessional, Susie and Lee joyously exited to James Taylor’s “How Sweet It Is To Be Loved By You,” and by the expressions on their faces, they knew. Their guests relaxed in the foyer while enjoying cocktails and Jazz selections, including some of Lee’s favorites from David Benoit. Then it was time for the grand entrance, and we planned out some energetic and personalized introductions with custom music! Their wedding party loved it, and we were off to a great start! The toasts were special because between the salads and entrée, both of Lee’s daughters gave heartfelt speeches that had many of their guests reaching for their tissues. At the end of dinner to keep the festive mood going, we surprised (in a good way!) a few of their friends by recognizing their birthdays which were also in July, then everyone had fun with a contest to win the centerpieces on each table! Then I shared a special introduction for Susie and Lee before their first dance. 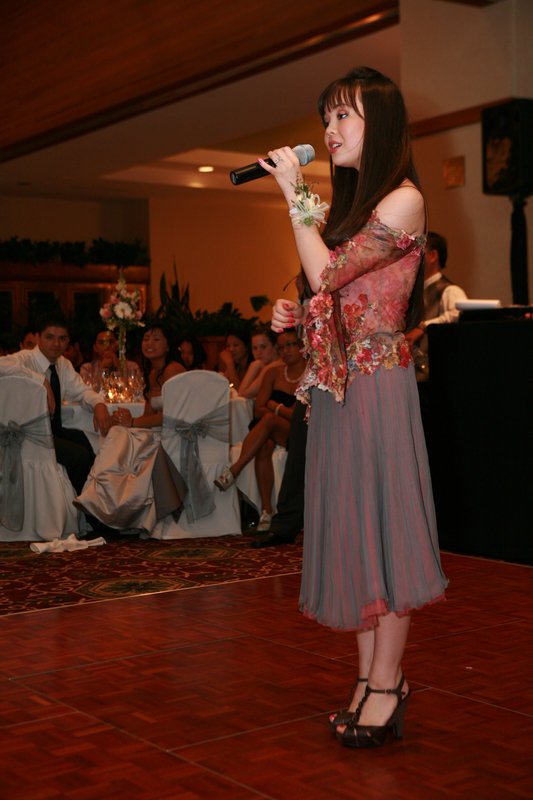 They stepped to the dance floor, and with over 200 pairs of eyes on them, Anna Maria took my mic, and sang her heart out. What a wonderful way to begin a marriage! Susie and her father each prepared some touching, funny, and sentimental dedications to each other before their father/daughter dance, and then it was dance party time! Bryan Adams, ballroom swing, Elvis, the Romantics, Michael Jackson, and other great selections kept everyone on their feet until it was time for a fun and unique cake cutting ceremony. Next, the guys ambled up to the dance floor, and we played a medley of the “Two and a Half Men” TV show theme (one of their favorites! ), into “Bad Boys,” (Susie is a Police Dispatcher), into the “NBA theme” for the toss since Lee is a Lakers fan! I still remember one of their officer friends, “Baby Boy,” who was 6 feet, 5 inches tall…needless to say, he had an unfair advantage to catch the garter! Before we knew it, 6 hours of celebration, (and 4 hours of open bar!) had passed, and we ended their evening by playing “Hawaiian Wedding Song” with everyone out on the dance floor. 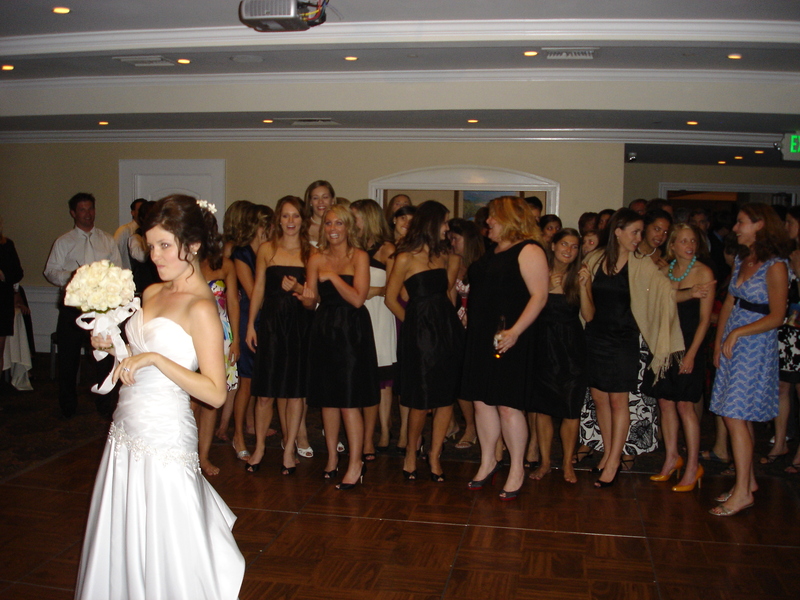 Then all of their friends and family went out front to the foyer for their grand exit to the limo while IZ’s “Somewhere Over The Rainbow” set the stage for their honeymoon in Hawaii. Oh, and many of their friends also went along with them to Hawaii for more celebrating! Mr. And Mrs. Susie and Lee Mirasol, it was my honor and pleasure to be a part of your wedding celebration, and please keep in touch. 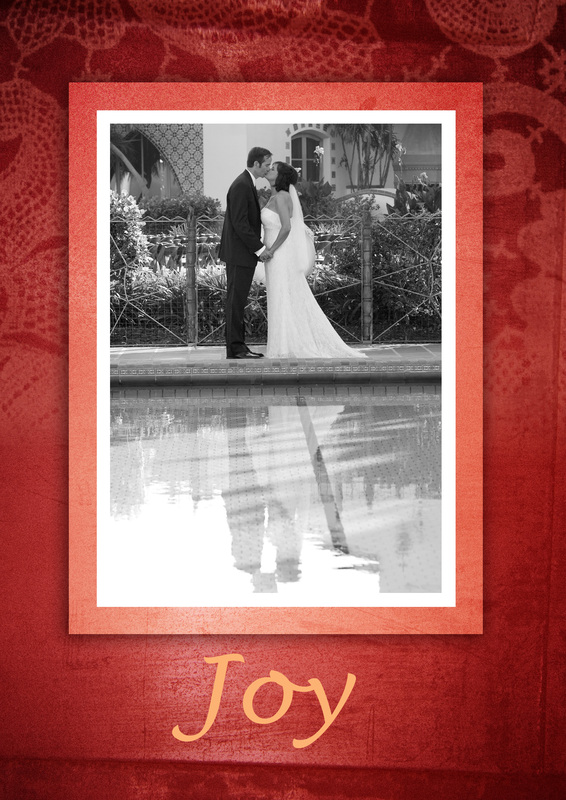 Best wishes for many Happy Anniversaries…and low, low, golf scores! Kristen and Wes called me because one of their friends had seen me at a previous wedding, and liked my style. As soon as I met them at their home in Pasadena, I was pretty sure that I would be able to make them very happy! They had met back in college at UCSB, and had been going out for…“a while.” Hanging out with them in their living room and getting to know each other was a lot of fun, and one of the first things I learned was that their favorite cerveza is Pacifico. They were looking for a fun and upbeat celebration where everyone would have a great time, as they both have outgoing families, and there would be a hosted bar. I also found out that Wes really knows his music! Kristen’s main concern was even though it was her day, she didn’t want to be “in the spotlight” too much, and we discussed ideas for their wedding program that made her feel comfortable. We also talked about some staging and layout options to best utilize Cicada’s awesome two story art deco design. On the big day, they arrived with their wedding party, and all of their guests were enjoying piano and classical guitar selections that were playing on my system. Their ceremony began with the seating of their grandparents and parents to Nat King Cole’s “Unforgettable,” and Wes’ Uncle Craig was their officiant. At the conclusion of their ceremony, everyone rose to their feet and applauded as Harry Connick Jr.’s “It Had To Be You” set the tone for the cocktail and dinner atmosphere! Upstairs in the lounge, their guests enjoyed classic cocktails and the crooning of “Max,” who specializes in “Rat Pack” selections. Max is one cool cat, and he also performs during the week at Cicada. Their grand entrance was truly grand, as we had each bridesmaid and groomsman walk down either side of the staircase, then they joined each other on the landing, and continued down the rest of the way to the head table. It was sophisticated, and dramatic! During dinner, since Kristen loves the rat pack crooner classics, Max sang for a while, and then I took over. 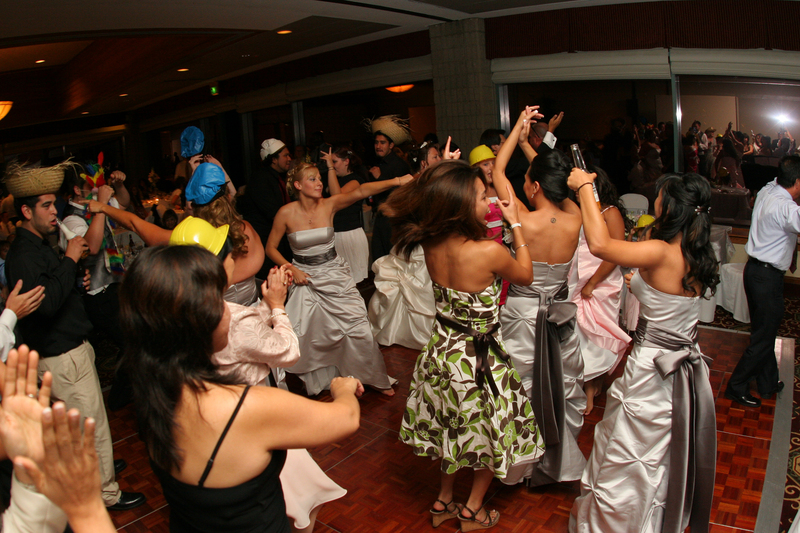 When it was time to get down and party, it was a big mix of Motown, soul, 80’s, Top 40, and….the song of the night? A little backstory….during our planning meeting, Wes mentioned that “The Darkness” was their “inside joke band” from their college days, but he got busy with work, and didn’t have a chance to email me their favorite songs, or bring the CD. So the night before their wedding, I hopped on iTunes, and downloaded a few of what sounded like “The Darkness’” best hits. Around 1130PM, Wes suddenly had a flashback! He apologetically asked if perhaps, by any chance (?) I just happened to have any of “The Darkness” songs, and I showed him what I had on file. His face lit up, he pointed to their favorite (“Girlfriend”), we got all of their friends out to the middle of the dance floor, and it was two and a half minutes of “one hit wonder” pandemonium! All I can say is that they are some of “The Darkness’” biggest fans! 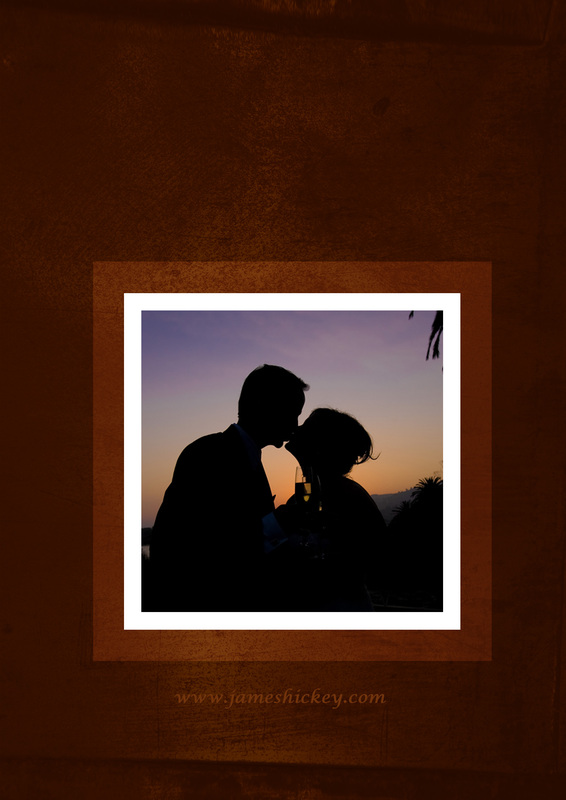 Kristen and Wes ended their evening by saying their farewells, and I remember chatting with their parents for a little, and we agreed that it was a successful event….classic, fun, and it fit their vision and personalities, perfectly. It’s a few months past their one year anniversary as I type this, and Kristen can’t believe that time has gone by so fast. Congratulations to Mr. And Mrs. Wesley Bray. Keep on dancing!